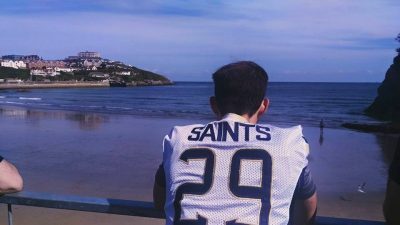 On SATURDAY 18th July, the Oxford Saints made the long journey down to Newquay and came home with a 13-12 victory over the Cornish Sharks! 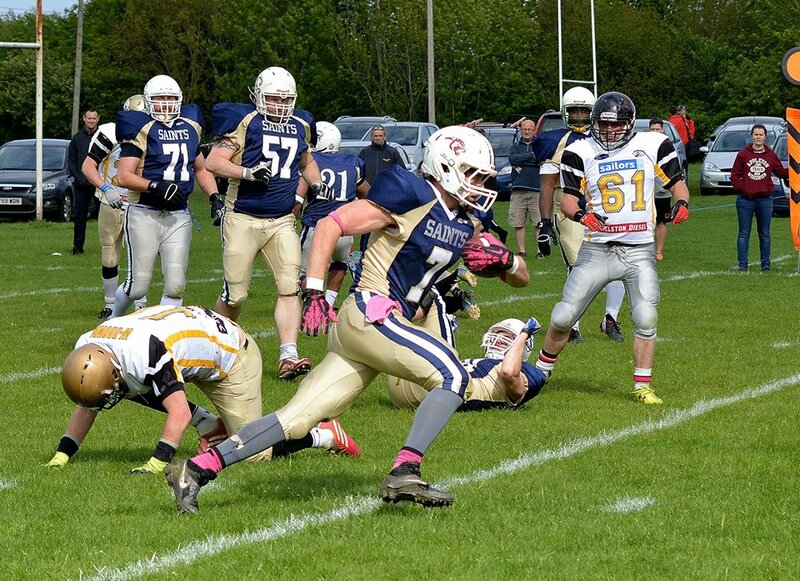 The Saints made swift work of the Sharks earlier in the season with a 43-24 win when they visited Oxford. The last time the Saints travelled to take on the Sharks on their own turf was in 2013, where Oxford suffered a 51-0 defeat. 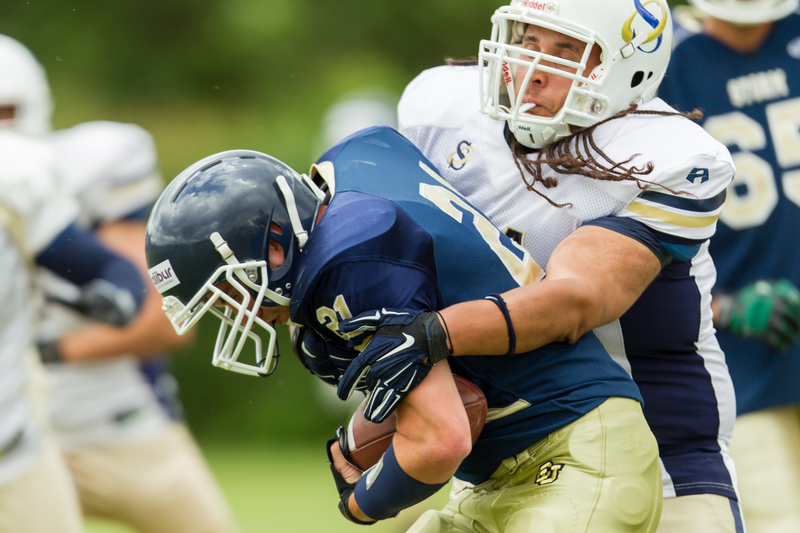 Although already guaranteed a playoff spot due to being 2nd place in division II – Southern Football Conference West (SFCW), a win over the Sharks was still important as the Saints now go into the playoffs on the back of a 2 game winning streak. 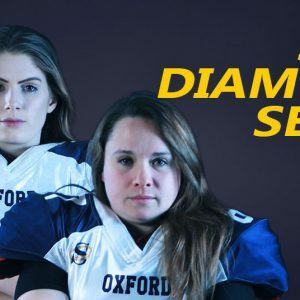 The quarter finals are on 23rd August but with several teams still winding up their regular season, it is not yet decided who Oxford will face in the first round. Travelling with a smaller squad than usual, several changes were made to the starting line-up. On the offensive line, first year player Rob Dennis was awarded with his first starting position alongside Chris Daniels. With only one travelling full back, Chris Roberts and Antonios Athanasiou switched from their usual positions and shared the workload. 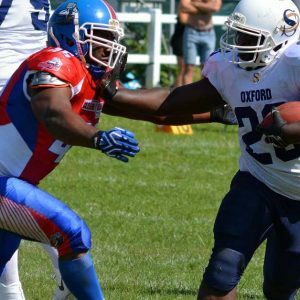 This game marked a special occasion for the Saints as veteran linebacker and team captain Dean Bryan recently celebrated his 10th year competing in American Football and was playing in the 100th game of his career, all for Oxford. With the Sharks winning the coin toss and choosing to start with the ball, they took over from their own 29 yard line following the kickoff. The Saints were caught short as quarterback Joseph Wolfenden-Brown threw a deep pass to wide receiver Isaak Marshall, who hauled in the pass over the top of the Saints defenders and ran into the endzone for the score. 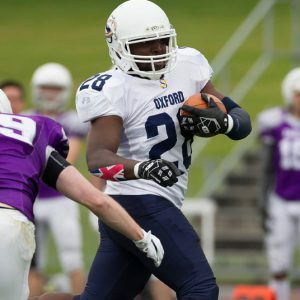 Othniel Lewis attempted the extra point kick but it was blocked by the Oxford defense, leaving the hosts with an instant 6-0 lead. Stunned by the quick score, the Saints offense took to the field and looked to make their own statement. Led by first year quarterback Ben Denton, they quickly earned a first down with a 17 yard reception from tight end Rich Bloomer. Looking to establish the often dominating Oxford run game, Denton handed the ball off to James Walter who fought his way through the Sharks defense and picked up another first down. With the Saints approaching Sharks territory, a jumping catch for a 6 yard gain by Sam Armstrong brought Oxford to 3rd down with just 4 yards needed to pick up another first. The ball was once again handed to Walter who broke off a huge 34 yard touchdown run. Denton attempted a 2 point conversion and a pass intended for Bloomer was incomplete, leaving the score tied 6-6. Following Walter’s big gain, he has now reached a milestone of 1,000 rushing yards in the 2015 regular season. A commendable and uncommon achievement outside of the professional level, Walter has ran riot against opponents throughout the year and has often been a game-changing force on the field. With the Saints defense back on the field, everyone was acutely aware of the deep passing threat from the Sharks and were keen to not be caught out again. Quarterback Wolfenden-Brown kept the ball on the ground to begin with and handed it to his powerful running back who picked up a first down before being tackled by free safety Michael Bearman. A further run attempt was stopped short after just 2 yards by tackles from defensive end Adam Baker and linebacker Graeme Taylor. In need of a first down, the Sharks looked to throw but two incomplete passes forced the turn over and the Saints offense took over from the 20 yard line. Running backs Grant Tebb and James Walter attempted to find their usual rhythm but were struggling to make any significant gains against a determined Sharks defense and the ball was soon turned back over to the hosts. Much of the first half continued in the same fashion, seeing a back and forth battle as both defenses stood firm and controlled the flow of the game. It was the Sharks who were the first to break the cycle with strong running from their main running threat, Othniel Lewis. Fast approaching the Saints endzone, Lewis found room to run on several plays and picked up first downs against the Oxford defense. The score came when Wolfenden-Brown handed the ball to running back Shaun Griffin who ran up the middle for a 4 yard touchdown. Lewis attempted the extra point kick and it was again blocked by the defense. Sharks extend the lead 12-6. As the endzone drew closer, the Sharks continued to find room to move on the ground. The ball carrier picked up 6 yards before being brought down by Wright and Bearman, with Taylor then driving the ball carrier back for a 3 yard loss on the following play. Facing 3rd down, rookie defensive end Sam Stancombe struck Wolfenden-Brown for a big sack and a 7 yard loss at a crucial moment. Stancombe suffered a serious injury during the pre-season and only returned for the final 2 regular season games of 2015. 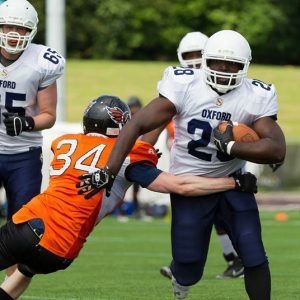 He has quickly made his mark and proved he’s fit to play again, after landing an equally impressive sack 2 weeks prior in Oxford’s big win against the Swindon Storm. On 4th down, the only option was for Wolfenden-Brown to attempt a 20 yard pass into the endzone for the score. As the ball was snapped, receiver Isaak Marshall sprinted across the field on a slant route and caught a quick pass over the middle, closely pursued by cornerback James Dunstan. Catching the ball at the 2 yard line, Marshall was immediately tackled to the ground by Dunstan and Taylor just short of the goal line. With a close 12-6 lead for the Sharks, the Saints started with the ball to begin the 3rd quarter and continued their hunt for the equalizing score. The Sharks defense came out strong and prevented Denton from picking up a first down, following incomplete passes intended for Walter and Armstrong. The Sharks kept the ball on the ground for their next drive and picked up a first down, with the tackle coming from strong safety Martin Fitzpatrick. On the next play, the towering rookie defensive end Conor Whitehouse hit the ball carrier and forced a fumble but it was recovered by the Sharks and they maintained possession. Unable to make any gains and a 3 yard tackle for a loss by linebacker Calvin Holmes, the Sharks were forced to punt the ball away. Taking over from their own 4 yard line, the Saints offense were in a risky situation as they were backed up dangerously close to the endzone. Attempts by Kev Brooks and Walter to give the offense breathing room were shut down by the Sharks defense. On 4th down with everyone expecting a punt, the ball was snapped to Walter, who normally performs the punting duty, but instead of kicking the ball away he threw a pass to tight end Rich Bloomer who had broken out into space. Bloomer hauled in the 18 yard pass and the Sharks were caught off guard. Despite the success of the trick play, the Saints were unable to pick up a further first down but it did give them a better position to eventually punt the ball from. As the Sharks offense took over from their own 26 yard line, another first down was swiftly picked up on the ground, before another first down run for 16 yards was brought down by cornerback Mike Turner. On 2nd down, Spencer Duffy delivered the 2nd sack on Wolfenden-Brown by the Oxford defense, this time for an 8 yard loss. On 3rd down a pass to Isaak Marshall was completed for 9 yards and the ball carrier was brought down by Dunstan, bringing up the punt on 4th down. 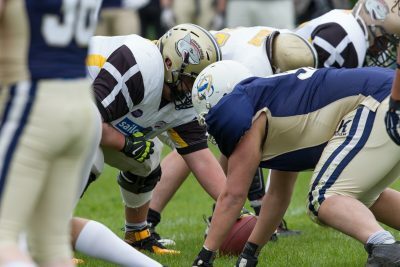 In the 4th quarter, the game remained closely contested with both offenses attempting to find holes in the imposing defenses. 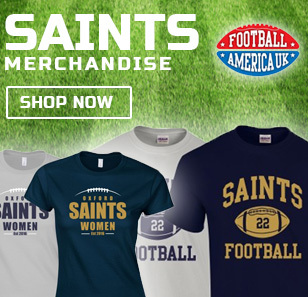 The Saints defense increased the intensity and began to greatly limit the Sharks offense on the ground. On 2nd down, rookie defensive tackle Dann Harvey showed great determination as he pursued the ball carrier out towards the sideline before tackling him for a 1 yard loss. 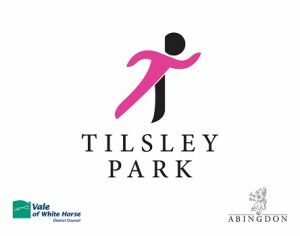 The Sharks soon found a first down with a 19 yard pass from Wolfenden-Brown, with the receiver brought down by Turner. On the next play defensive tackle Deke Morton stopped the ball carrier for no gain. On 4th down the Sharks fumbled the ball and they recovered in the backfield, but for a 16 yard loss. Denton led the Saints offense out with great field position, starting on the Sharks 33 yard line and a short distance to score. The ball was handed to Antonios Athanasiou who picked up 4 yards. A completed pass to Walter for a 7 yard gain gave Oxford the first down. Walter’s number was called again and he charged through for a 17 yard gain and another first down. With just a few yards out, Athanasiou received the ball and smashed his way into the endzone for a 4 yard touchdown, marking his first touchdown with the Saints after transferring to the team at the beginning of the season. With the score tied, head coach Andrew Day called for the extra point kick attempt and Spencer Duffy took to the field. The ball was snapped by centre Gordon Cutting, and was quickly put in position and held in place by 2nd string quarterback David McCormack. 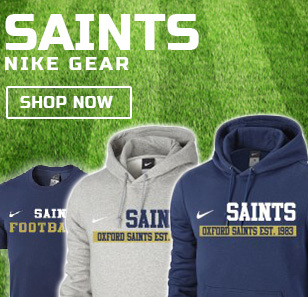 Duffy kicked the ball through the uprights and the Saints edged forward with a 1 point lead. 13-12. Following a good return on the kick off, the Sharks offense took over from the Oxford 35 yard line and they themselves only had a short distance between them and the score. All eyes were on the Saints defense who needed to make one more stop to seal the game. A new quarterback for the Sharks was thrown into the mix and the ball was kept on the ground but his running backs found nowhere to go, with an Oxford defense which was now even more fired up, fighting to maintain the win. The first attempt was brought down by Duffy, and a 4 yard gain on the 2nd run attempt was stopped by Duffy and Holmes. In desperate need of a 1st down, Stancombe delivered a further blow to the Sharks with a tackle behind the line for a 2 yard loss. On 4th down with 7 yards to go, the quarterback attempted the pass and targeted his receiver over the middle of the field but the jump-ball was contested by strong safety Martin Fitzpatrick who disrupted the play and broke up the pass. The Saints defense celebrated as they took to the sideline and the offense came out for their final drive. With time running out, the Saints picked up a first down thanks to a penalty against the Sharks and then chose to take a knee to run out the remaining seconds, sealing the 13-12 victory. Concluding the regular season with another win, the Saints now sit at the top of the Southern Football Western Conference. However as Bristol still have two games to play, it is unlikely that Oxford will maintain the top spot unless Bristol suffer defeats in both. 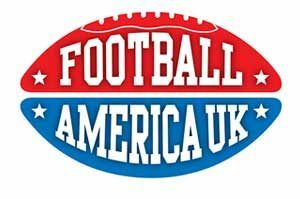 The regular season of the British American Football National League sees it’s last games being played on August the 9th, so the Saints have several weeks to prepare before finding out who their first playoff opponent will be. A closely contested game and a rare occasion where it was not the Oxford offense which led the game in yardage. The Sharks picked up 136 yards on the ground with another 133 in the air, for a total of 254 on offense. Meanwhile the Saints picked up 124 on the ground (96 from Walter alone) and another 68 in the air, for a total of 192 on offense. Both teams suffered from fumbles but were able to recover their own. Oxford QB Ben Denton recovered two fumbles and the Sharks recovered all three of theirs. 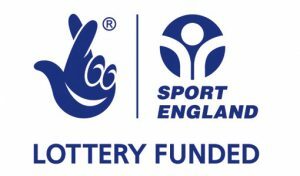 Penalties were a common sight throughout the game with 7 against Oxford for 35 yards, and 8 against Cornwall for 55 yards. Ben Denton attempted 14 passes and completed 4, for 50 yards and 0 TD’s. Cornwall’s Joseph Wolfenden-Brown attempted 19 passes and completed 7, for 133 yards and 1 TD (on the opening play of the game) . Wolfenden-Brown was sacked by the Saints defense 2 times for a total of 15 yards. Running back/tight end James Walter put in another strong performance. Walter took 18 carries for 96 yards and 1 TD, with an average gain of 5.3 yards per carry. He also caught 1 pass for an additional 7 yards. Running back/wide receiver Antonios Athanasiou picked up 19 yards on 6 carries, including 1 TD. He also caught 1 pass for an additional 20 yards. The defense put in another defiant showing and limited the Sharks to just 12 points, including several 4th down stands which prevented further touchdowns. Linebacker Spencer Duffy led the day with 9 solo tackles and 3 assists, including a sack for 8 yards. 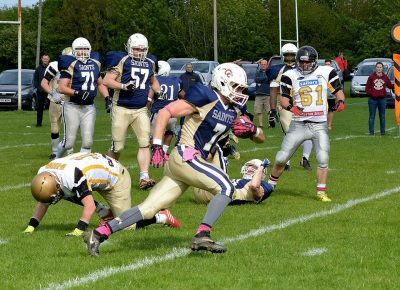 Following Duffy was fellow linebacker Graeme Taylor with 3 solo tackles and 5 assists, including a crucial tackle on the 2 yard line preventing a Sharks touchdown.